Community Action Partnership of North Central Missouri's Energy Services Program is responsible for developing, coordinating and implementing programs related to energy conservation and education. The department also manages the operation of the Low-Income Home Energy Assistance Program (LIHEAP) and coordinates with the agency’s Weatherization Department to identify potential customers, enhance partnerships with area utilities and provide energy educational opportunities. The mission of the Low Income Home Energy Assistance Program (LIHEAP) is to assist low income households, particularly those with the lowest incomes that pay a high proportion of household income for home energy, primarily in meeting their immediate home energy needs. Please note: incomplete applications, or applications missing required documentation, cannot be processed until everything requested by our processors has been provided. NO WINTER PAYMENTS WILL BE ISSUED UNTIL AFTER NOVEMBER 1ST, 2018 (ELDERLY/DISABLED) AND DECEMBER 1ST, 2018 FOR ALL OTHER HOUSEHOLDS. LIHEAP qualifies at 135% of the federal poverty level. View income guidelines. No appointments are necessary to apply for EA (Energy Assistance), a client visits, calls, emails, or faxes our office requesting energy assistance, completes an application each year, and provides the required supporting documents (such as proof of income, copies of social security cards, and utility bills). 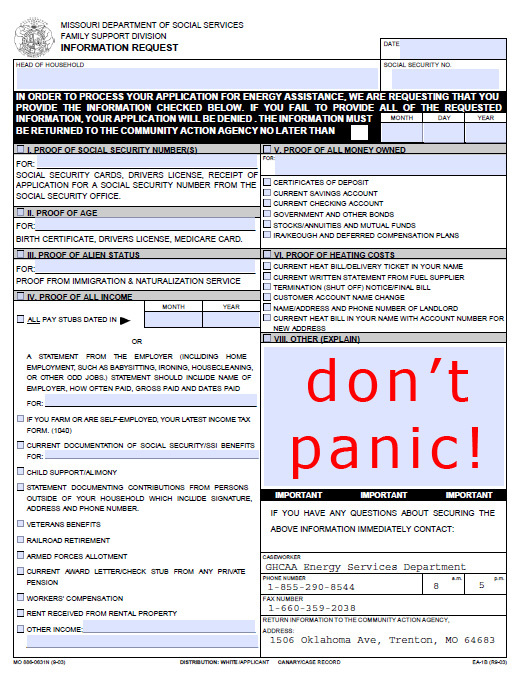 Applications are categorized based on the severity of the applicant’s emergency - households with shut-off notices are given priority over those who are not in imminent danger of disconnection. Once the paperwork is received, our processors go to work entering the required information into a state maintained computer program which calculates if the applicant qualifies and what the amount of their energy benefit will be. Once the application is processed and verified, the LIHEAP processors at CAPNCM notify the utility company with a “pledge” that the awarded EA amount will be paid. The state takes the lead from there, contacting the applicant’s utility company, who must then confirm the applicant as a customer, once confirmed, the State of Missouri (not our office) will cut an energy assistance check and mail it directly to the vendor. The ECIP program provides payment of energy bills when an eligible household is disconnected or threatened with disconnection. ECIP (Energy Crisis Intervention Program) funds are emergency monies provided to households who have already been approved for EA and currently have a new or secondary disconnection notice. Pledges are submitted in the case of an ECIP as well, with our agency's processors contacting utility companies in the mid-afternoon, generally around 4pm - 5pm. ECIP checks are then processed, cut, and mailed out by CAPNCM directly to utility companies. To qualify for ECIP funds, a household must be approved for Energy Assistance (LIHEAP) and submit a copy of a shut off notice for natural gas, electric, etc, or fall below 25% in a propane tank. Additional paperwork may be required if you use a wood vendor or wood pellets. If in doubt, please feel free to contact our office by calling 855-290-8544 and hit "0" to reach a live operator. Social security numbers for every member of your household need to be fully listed on the application. Primary AND secondary heating sources MUST be listed on the application and a bill included for EACH. Winter assistance begins November 1st, 2017 for the elderly or disabled, and December 1st, 2017 for all other households. No funds will be available for utility assistance prior to those dates. If you have questions regarding this program, please contact the agency at 855-290-8544 and hit 0 for an operator. Completed and signed LIHEAP Application. Copy of your primary heating bill or a letter from the company stating you are a customer (must show your name, address, and account number). Copies of social security cards for EVERY member of your household who does not receive food stamps. Proof of income for EVERY member of your household over the age of 18 from the prior month. Failure to provide proper documentation and application forms will result in a delay in the processing of your assistance. If/when you receive this letter in the mail - do not panic. Pay attention ONLY to the highlighted portion of the form. All this form means is that we need a bit of extra information of some sort from you. Details will be highlighted on the form. You are not required to complete the entire form. If you need longer than the allotted 10 days to return the requested information, just call us (855-290-8544) and let us know. LIHEAP offers assistance during both the winter months and the summer months. Begins November 1st each year for the elderly and/or disabled. Begins December 1st each year for all other households. Every household MUST reapply annually. New application period closes March 31st. New application period begins June 1st. If you were approved for Winter EA, and have NOT moved, you DO NOT need to fill out a new application. If you HAVE MOVED since you were approved for Winter EA, you WILL need to fill out a new application. Summer assistance can ONLY be used for electric bills with a current shut-off notice. Step 2 Sign your name in blue or black ink. Step 3 Send or take your completed application to the office that serves your community. To find that office, see the last page on the application instructions or call the FSD INFO LINE at 1-855-373-4636. A person with a disability or over age 60 lives in my home. When can I apply and expect payment? You can apply starting October 1st. Payments to utility companies begin November 1. No one disabled or over 60 lives in my home. When can I apply and expect payment? You can apply starting November 1. Payments to utility companies begin December 1. Contact the agency where you submitted your application and tell them you moved. You will need to complete a new application with your new address and submit it and a copy of the fuel bill which shows your new address. Check where you should send your application, it may need to go to a new location. A new application is needed only if you have moved or changed your main heating source. Do I fill out an application in June for the summer crisis program? The summer program can only assist you if your electric is in threat of disconnection or already shut off. You do not need to complete an application if you received energy assistance the previous winter. If you have moved, you will need to complete a new application. Applications are processed within 30 business days, unless you have a disconnect notice or are already shut off.